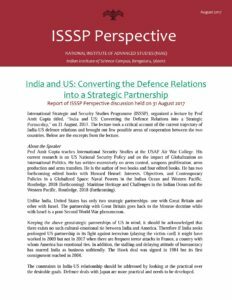 International Strategic and Security Studies Programme (ISSSP), organized a lecture by Prof Amit Gupta titled, “India and US: Converting the Defence Relations into a Strategic Partnership,” on 31 August, 2017. The lecture took a critical account of the current trajectory of India-US defence relations and brought out few possible areas of cooperation between the two countries. Below are the excerpts from the lecture. The report is prepared by Ms. Sourina Bej, Research Associate at the ISSSP.